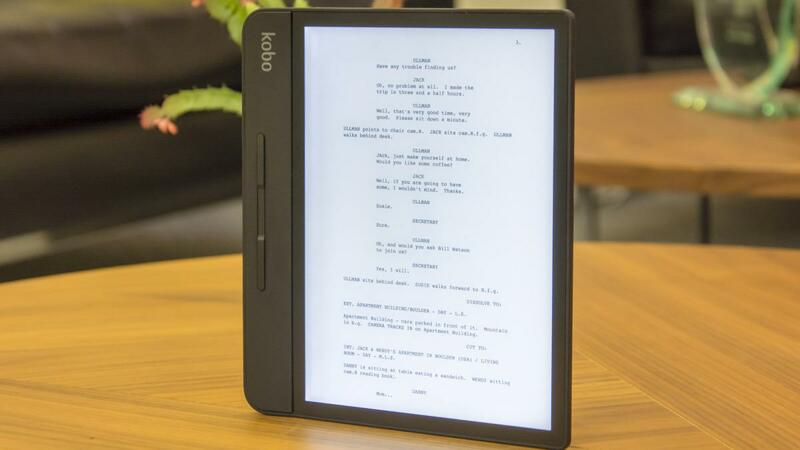 Canadian ebook company, Kobo, is decidedly an underdog in its fight against the Amazon-branded Kindle but that hasn’t stopped it from putting out a new flagship device in an attempt to level the playing field. 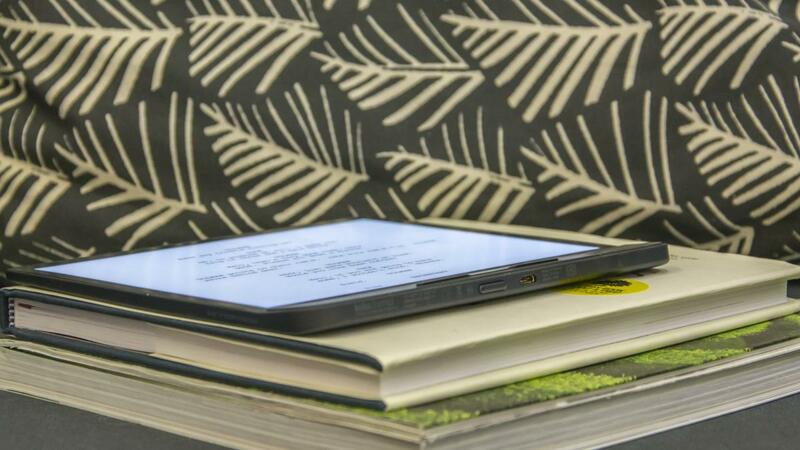 The Kobo Forma is a direct competitor to the magnificent Kindle Oasis; the question is, up against the might of Amazon, can any company compete? 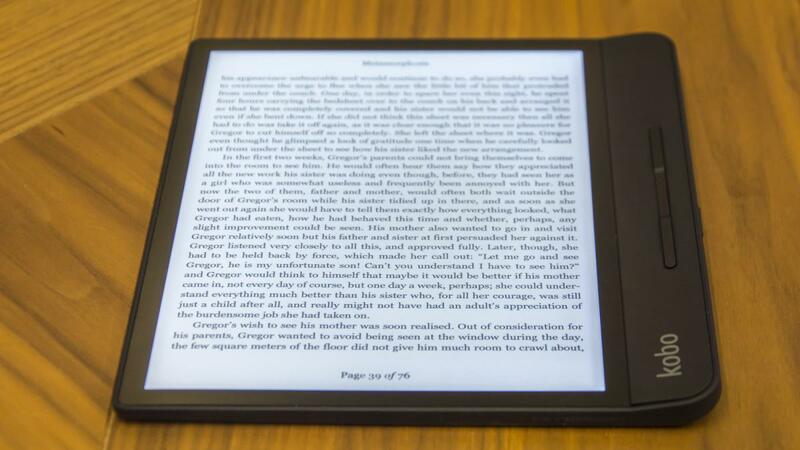 Kobo’s previous flagship ebook reader was the Kobo Aura One. At the time of release, it was the best attempt any company had made at challenging Amazon’s Kindle ebook empire, certainly at the high end. 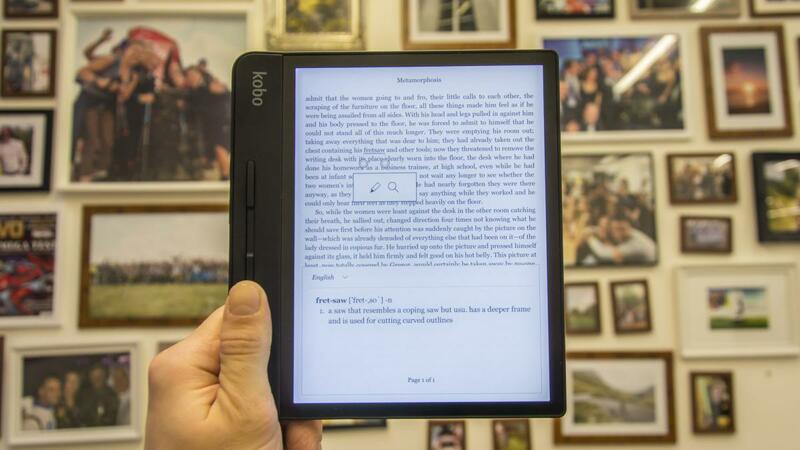 The Aura One is now discontinued and has been replaced by the Forma as Kobo’s premium reader. 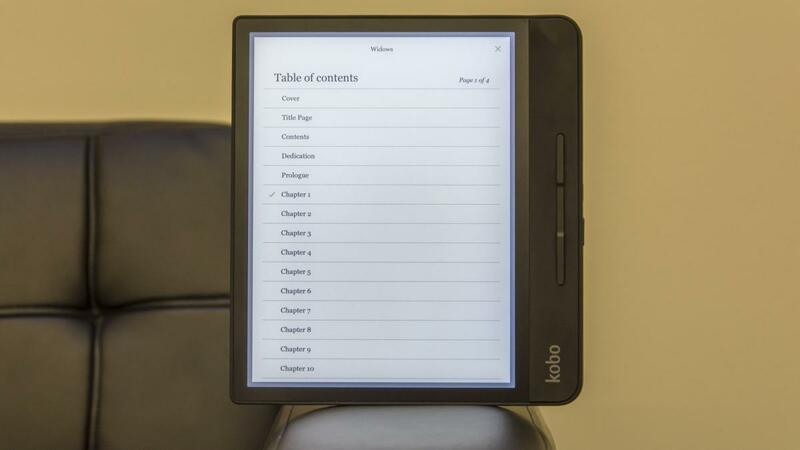 Released in October 2018, the Kobo Forma is a waterproof Kindle Oasis rival, which rather obviously copies significant elements of its rival’s design. Available with either 8GB or 32GB of non-expandable storage, it has an 8in 300ppi E Ink display and a 1,200mAh capacity battery with the potential to last weeks on a single charge. While the Forma has Wi-Fi connectivity and a primitive web browsing feature, it lacks the ability to store and play audiobooks like the Oasis. 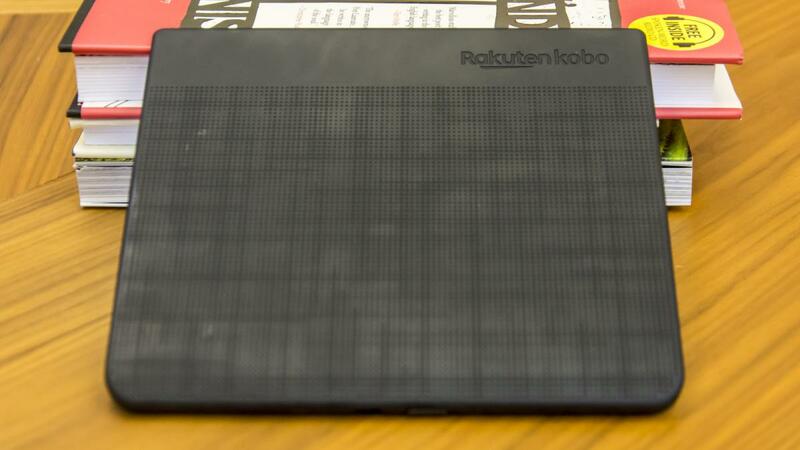 There are two prices for the Kobo Forma, depending on how much storage you’d like. The 8GB configuration costs £240, while the 32GB model will set you back £290. That’s an awful lot of money and those prices are steeper than the Kindle Oasis, which starts at £230 for the 8GB model and jumps to £260 for the 32GB. The top-end Oasis costs even more at £320 but it delivers 3G network connectivity in exchange, which is something Kobo can’t offer. You have to ask yourself, too, whether you’d not just be better off with the even cheaper Kindle Paperwhite. It costs only £119 and offers similar features to the Oasis, with waterproofing and Audible Audiobook support included; it has a smaller 6in display, however. There are elements of the Forma’s design that owe a clear debt to the Kindle Oasis: the offset screen, the buttons on a grip off to one side, the ultra-thin chassis and the IPX8 waterproofing, which means you can dunk the Forma in up to two metres of water for up to half an hour. The two devices are very obviously cut from the same cloth. But there are just as many differences as there are similarities. Where the Oasis has a burnished aluminium rear and sharp edges the Forma is clad in rubberised plastic. 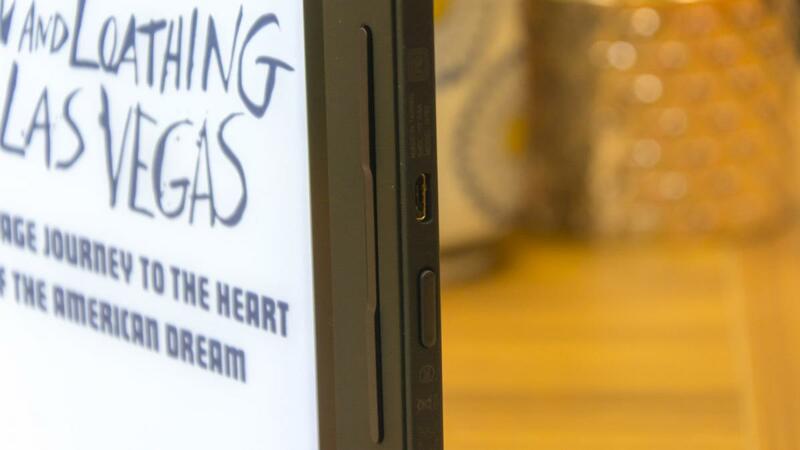 Where the Oasis’ page turn buttons are on the same level as the screen, the Forma’s are mounted on an angled spine that makes it easier to hold and emulates the feeling of holding an open book. The Forma is larger, too, with an 8in screen compared with 7in on the Oasis. More screen means more reading space and that angled grip means it’s easier to hold than the Aura One. It’s surprisingly slim and light, too, measuring a mere 8.5mm at its thinnest point and tipping the scales at 197g – a negligible 3g heavier than the smaller Oasis. Having said that, dimensions of 160mm across and 177mm vertically means the Forma won’t fit in a coat pocket readily. Finding books to read on the Kobo Store is straightforward although I’d advise using a computer for proper browsing sessions – the Forma is a slow-loading device. Moreover, it’s much harder to find cheap or free books on the Kobo Store compared with the website because there are fewer search filters available. As for selection, the Kobo Store practically has it all. 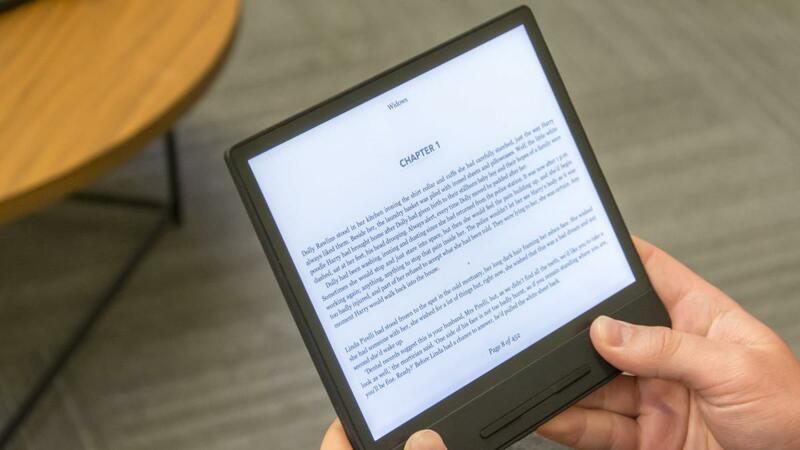 It is generally pricier than Amazon’s Kindle Store, however, and that’s one reason Kobo has failed to keep up with its rival. 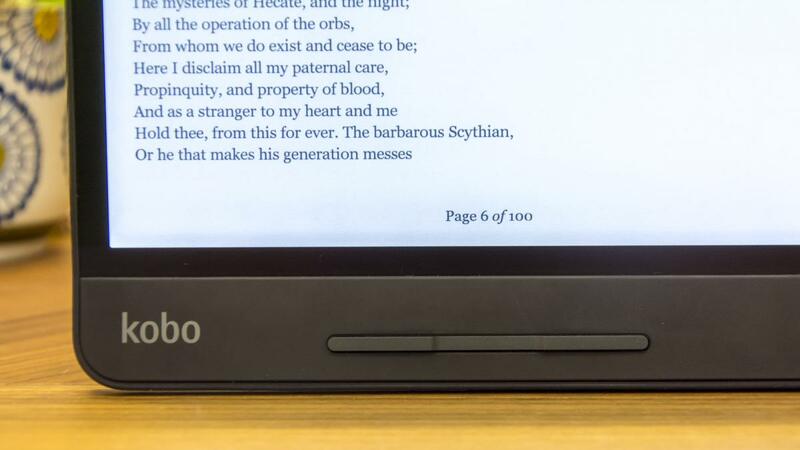 Reading on the Kobo Forma is a pleasure. Its 8in 300ppi E Ink Carta display is exceptional: text appears crisp and clear at even the smallest of font sizes, eye-strain is non-existent and viewing angles are superb. There are 17 LEDs – a mixture of red and white LEDs – dotted around the display to provide an even distribution of light across the panel and the illumination is almost perfectly distributed. There’s one small strip right alongside the grip which isn’t quite as bright as the rest of the panel but it’s only visible at certain angles and is by no means a distraction. 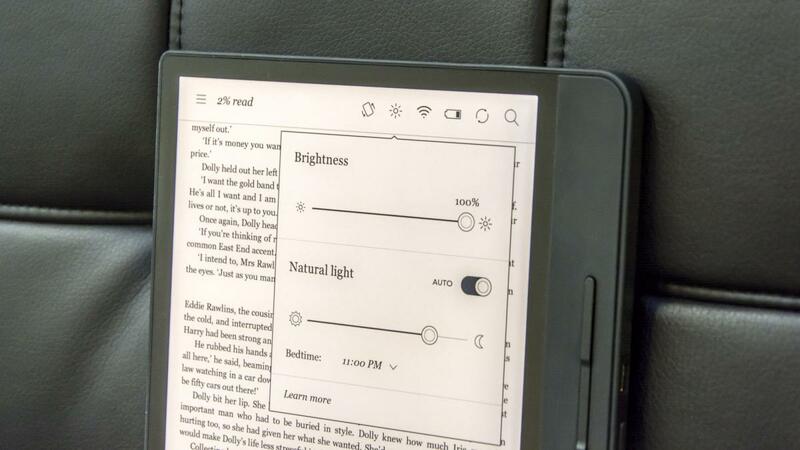 Kobo’s “Comfortlight” technology is a real selling point, capable of filtering out blue light as day turns to night and it isn’t’ a feature any of the Kindle ebook readers can boast. Enable the Natural Light setting and the panel’s illumination gradually changes from bright white to a warm red as it approaches your designated bed-time. Reduced blue light helps you to relax and it’s definitely much better than bathing yourself in the light of your smartphone or tablet immediately before hitting the pillow. There’s no external light sensor on the Forma, however, so the overall brightness must be adjusted manually. 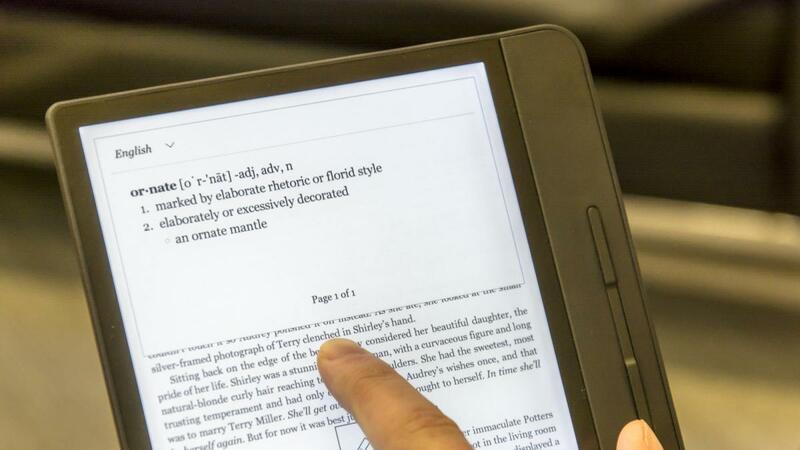 Customising your reading experience on the Kobo Forma is also easy. There are over 50 font styles to play around with and you can set the font size, line spacing and margins to your exact preferences. I usually prefer to stick to the publisher default font so I can read ebooks as they were originally intended but I do fiddle around with font size depending on the title. You can also turn on text justification, too, to give the text a more “bookish” appearance. Adding other files besides ebooks is straightforward, too. 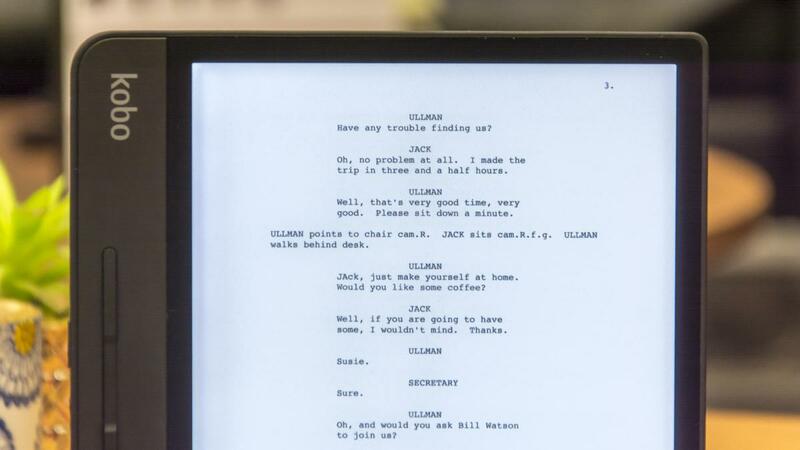 I connected the Forma to my work MacBook and transferred a folder full of PDF screenplays that I had saved in Google Drive. Within two minutes all 53 documents had been copied over and I was able to disconnect the Forma and view the scripts. There are fewer features on offer in PDF format. The dictionary word selection tool doesn’t work, for one. Page breaks appear as they do in the original files and font text cannot be changed but you can zoom in and out. Annoyingly, file names reverted back to their original state when I first downloaded them, despite my having renamed almost all of them. This makes for a less-than-neat list of books and authors. The Kobo Forma supports a total of 14 different file formats. In addition to PDF and EPUB, these are as follows: EPUB3, MOBI, JPEG, GIF, PNG, BMP, TIFF, TXT, HTML, RTF, CBZ and CBR. The Amazon Kindle Paperwhite supports a similar list but most aren’t supported natively, so you can’t just drag them into storage. Instead, you have to email them for automatic conversion to your Kindle email address. If you have a local library card then you’ll also gain access to a wealth of ebooks through the OverDrive online library. Thousands of libraries across the world support the service, and all you have to do is create an account – it’s easy to do on the Kobo Forma itself – and then search the OverDrive section of the Kobo Store. Most books I could think of were available in the database and within seconds I was able to download them for a two-week loan. Some titles are bound by One-Copy, One-User publishing rules, so if somebody else from your library has checked out a book you’d like, you have to wait until their time is up, but you can place a hold on it to ensure you’re first in line. Many of us are too busy to read a nice long-form article on a whim, which is why it’s wonderful to have the ability to save pages for later browsing. The Kobo Forma allows you to do this through the Pocket offline-reading ap, and I was prompted to make an account when I starting up the device. With the help of the accompanying Chrome desktop browser extension or smartphone app, you can then sync articles to read later on the Forma. If the Forma is connected to a Wi-Fi network it syncs right away, otherwise, it will sync the next time it gains online access. Pocket has its problems. One page I saved using the Pocket extension was dated January 2019 but when I synced the Kobo Forma I was shown a 2017 version of the same article that was not actually viewable in Google. Loading times are appalling, despite the fact that images and adverts are trimmed out; it can take over a minute to scroll to the bottom of a web page. Kobo also gives you access to its “experimental browser”, which is accessed from the Beta Features in the Forma’s settings. As an emergency measure when nothing else is available, this is just about usable, but load times are terribly slow and pages don’t show up as they do either in a desktop or mobile browser. 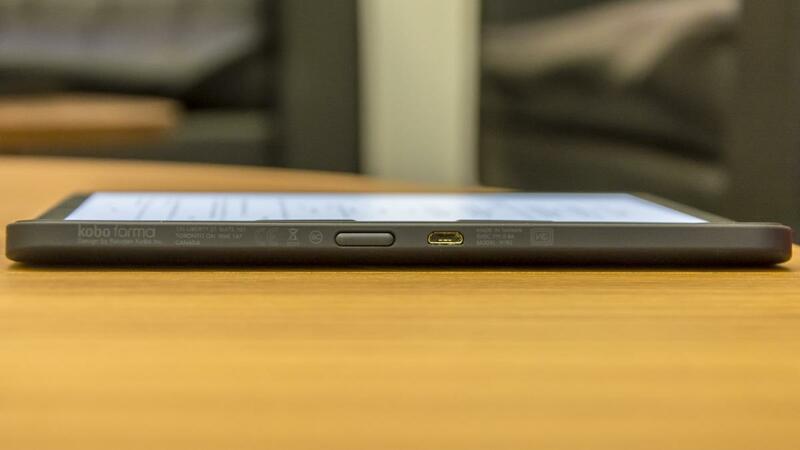 The Forma is a formidable Kindle Oasis rival but it’s not perfect. 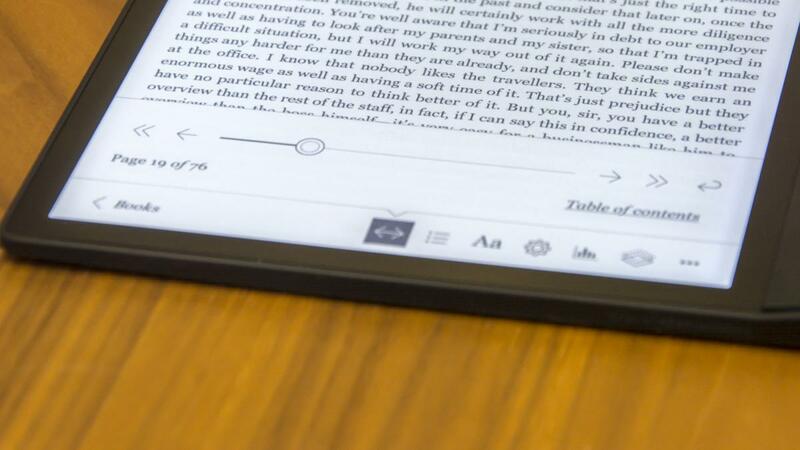 £240 seems a steep price for such a limited device, and the lack of audiobook support is a real shortcoming, especially as Kobo has its own Audible rival, now. Compared with the £120 Kindle Paperwhite, which has Audible integration and an equivalent IPX8 waterproof rating it seems very basic. Kobo does score points for its Comfortlight technology, though, and the sheer size of that screen, which is wonderful to read from. The OverDrive library access is another huge boon, and Pocket articles add a small element of versatility to the Forma as well. Overall, it’s a very solid effort, I just wish it was less expensive.